I know I have the best mom. I realize that many others feel the same way and I must admit that I hope my kids feel this way about me but that’s the way it should be, don’t you think? 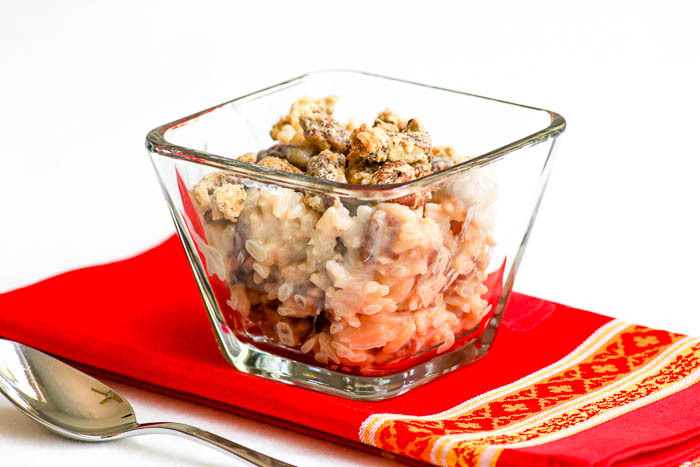 When my Sunday Supper family decided to celebrate Mother’s Day a week early by highlighting Mom’s Favorite Recipes, I knew exactly what I would make; Crustless Pecan Pie Rice Pudding. I entered this recipe into the Food Wine Conference #BreakTheRouxles contest and realized just how perfect the timing is to share with you now. You see, my mom is always open to trying a new dessert. Nana’s Rice Pudding was a staple in our house when I was growing up. Mom moved to North Carolina 22 years ago so I thought I would add in a bit of Southern flare into this classic dish. Actually, I went a step further. Nana’s Rice Pudding is baked in the oven. I cooked my rice pudding over the stove. The recipe below yields rice that is firmer so if you prefer a creamier rice pudding, increase the amount of milk used. 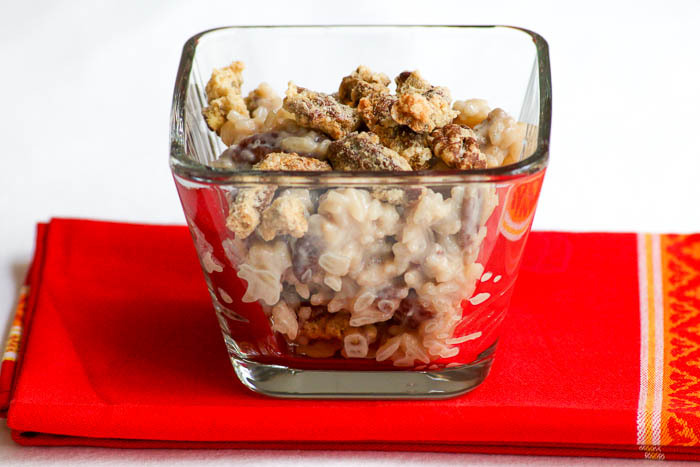 I know my mom is going to love Crustless Pecan Pie Rice Pudding. I hope yours does, too. By the way, if you are a blogger who loves food and wine, then you HAVE to join me at Food Wine Conference. Besides being an incredibly fun weekend, the knowledge learned at #FWCon is priceless. What is also incredibly exciting is that Happylicious by Betsy is a sponsor!!! You still have time to sign up. Use discount code DessertsRequired and you will save $50 off of your registration fee. If you prefer a creamier rice pudding, increase the amount of milk used in the rice pudding to 3½ - 4 cups total. The candied pecans may be made ahead of time and stored in a plastic bag. Preheat the oven to 250°. Line a baking pan with parchment paper and set aside. Stir together the egg white, sugar and vanilla in a small bowl until the mixture is creamy white. Mix in the pecan pieces. Transfer the mixture to the prepared pan. Bake at 250° for 50-55 minutes, stirring periodically. Place the rice, milk and salt into a medium saucepan. Cover and cook over low heat until most of the milk is absorbed, stirring frequently so that the rice does not stick to the bottom of the pan. Add the brown sugar, sugar and vanilla and continue cooking until the liquid is absorbed. Stir in the toasted pecans. 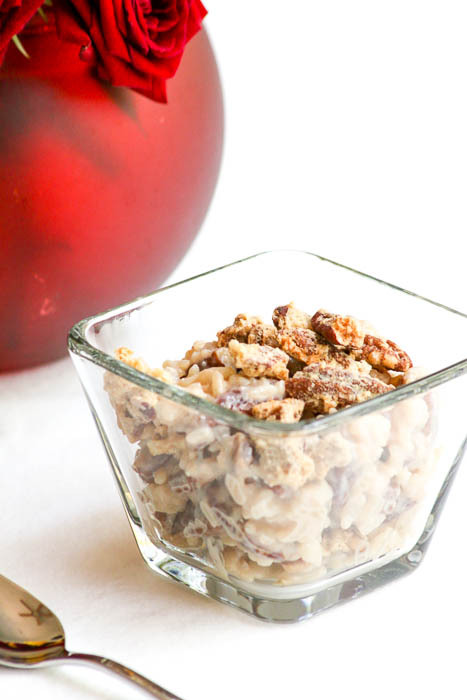 Transfer to individual serving bowls or one large serving bowl and top with candied pecans. The rice pudding may be served hot, room temperature or cold. If rewarming, add more milk while warming. Many thanks to Christie Campbell of A Kitchen Hoor’s Adventures and Wendy Leep Hammond of Wholistic Woman for hosting today’s wonderful event. Please be sure to check out the rest of the special Mom’s Favorite Recipes from my Sunday Supper family! This may be the BEST rice pudding ever!!! Who needs crust??? Not me! THIS may be the best compliment! Thank you!! Oh man, I’ve never had this version of rice pudding. LOVE the pecans! You’ve had me drooling over this since I saw the video go up on YouTube! You are so sweet, Connie. Thank you!! My mom loves rice pudding and she would love this. It’s gorgeous. Who needs crust really? This looks so tasty. Love the flavors in this dish. Thanks so much, Eileen. It’s fun to mix things up a bit. I love rice pudding and pecan pie – how can you go wrong? This looks so good – I love the combination of both candied and toasted pecans. Thank you. 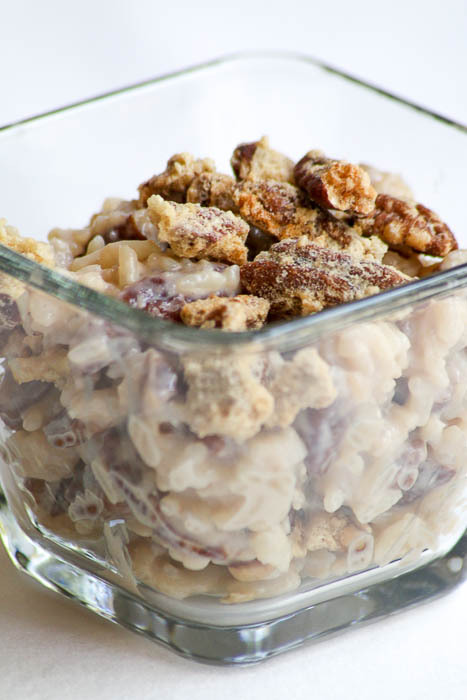 The candied pecans add a lovely sweet crunch to the top while the toasted pecans add a depth of flavor within. I would have hated this as a child but tastes have changed – it sounds delicious and love those pecans. It’s so funny how all of us have foods that we would never have tried as kids but love as adults. Glad this rice pudding is one of those for you! Rice pudding hot from the oven is another food memory I have of my Mom. Thanks for sharing.